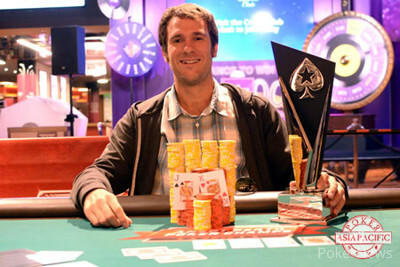 Congratulations to Patrick Mahoney, Winner of the ANZPT Perth Main Event ($120,000)! The second stop on Season 6 of the Australia New Zealand Poker Tour (ANZPT), and the first stop of 2014, has just come to a close at Crown Perth as the USA’s Patrick Mahoney was crowned the ANZPT Perth champion! 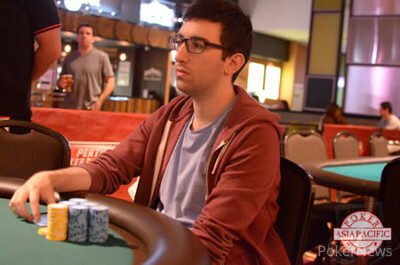 The final table featured seven Australians, and two from the USA, one of which was the eventual victor Mahoney. This is Mahoney’s first major live tournament win and the AUD$120,000 first-place prize is added to just over US$400,000 in previous scores. Mahoney tells us he will be heading to Sydney in a couple of weeks where he will try and win back-to-back ANZPT titles. The final table began around nine hours ago and in the end, it took just over two hours for the first player to be eliminated. It was Justin Walch who was the ninth-place finisher. 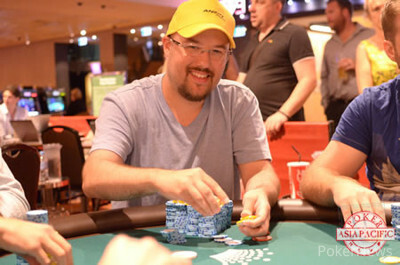 Australian poker veteran Vesko Zmukic was ground down to just a few big blinds on several occasions, but kept doubling up during the first few levels. Zmukic couldn’t hang on forever though and eventually fell to the rail in eighth place. Just moments after Murray hit the rail, Matthew Rolfe joined him in sixth place. The action didn’t slow down from here as recent Aussie Millions 14th place finisher Sal Fazzino was quickly eliminated in fifth place. Four-handed play would see the action once again reach a bit of a lull as it would be almost two hours before another player hit the rail. Eventually it was Brian Mcallister who was eliminated in fourth place. Right before three-handed play was about to begin, Blatt asked if Davies and Mahoney wanted to look at the numbers for a deal. Mahoney declined and so the action kicked back off. Blatt was the short stack at this point, but soon regained plenty of chips and once they were more even, the talks of a deal re-emerged. The players decided instead of doing a deal they would flatten the payout structure, basically making it so the third-place finisher was guaranteed at least $10,000 more. Not long after the payout restructure, Davies lost a big preflop all in pot against Blatt and was left very short. Davies then lost the rest of his chips a couple of hands later and was out in third place, collecting $57,400 and with that, the tournament was down to two. At the beginning of heads-up, Blatt had just over 3 million in chips to Mahoney’s stack of just around 1.7 million and at this point the players once again discussed a deal. The deal was cut short when the Crown Perth management deemed it was taking too long and so the original payout restructure remained intact. With the cards back in the air it wouldn’t take long for the tournament to be all over as Blatt was the runner-up, taking home $86,100 and Patrick Mahoney was crowned the champion! Congratulations to all the final table players on their effort, but more importantly to Patrick Mahoney for winning the ANZPT Perth title and $120,000 to go along with it! Our thanks go out to ANZPT President Danny McDonagh and the rest of the team at the ANZPT, along with Debb Wyatt and the staff at Crown Perth for their wonderful hospitality! Always a pleasure coming to Perth. The next stop on the Australia New Zealand Poker Tour is ANZPT Sydney, which runs from March 20th – 24th at The Star in New South Wales. The PokerNews Live Reporting Team will be at that event providing more live updates, so join us then! Dean Blatt Eliminated in 2nd Place ($86,100), Patrick Mahoney Wins! The final hand of the 2014 ANZPT Perth Main Event has just played out! Dean Blatt had the button and raised to 100,000. Patrick Mahoney called. The flop would see Mahoney check and Blatt bet 100,000. Mahoney then check-raised to 300,000 and Blatt re-raised to 700,000 and Mahoney moved all in for just around 2.5 million total. Blatt had just a little less than Mahoney and made the call. It was Blatt's middle pair and a flush draw versus Mahoney's top pair. The turn gave Mahoney trip jacks and the river meant it was all over! For his runner-up effort, Blatt pockets $86,100. Congrats to the champion, Patrick Mahoney! The player from the USA takes home $120,000! Patrick Mahoney opened the button to 100,000 and Dean Blatt called from the big blind. The flop would see Blatt check-call a bet of 100,000. The turn would see Blatt check-call a bet of 250,000 and a completed the board on the river. This time when Blatt checked, Mahoney bet 350,000. Blatt folded and the pot went to Mahoney. Mahoney lost a couple of small pots at the beginning of heads-up, and after this pot, moves back to 2.15 million, while Blatt is on 2.7 million. Dean Blatt and Patrick Mahoney have just tried to make a deal, but faced some difficulties. At first they did an ICM deal, chopping the entire prize pool. They were then informed that they needed to leave some money for the champion. The deal was pretty much agreed upon, but then the dealer pitched the cards at Wyatt’s insistence. Blatt tried to get to his cards in time, but they were mucked and he lost his big blind. He was then quite upset, not understanding why they couldn’t just finish the deal. The next hand was dealt, and very gentlemanly, Mahoney gave Blatt a walk. Blatt then asked Mahoney if they were still going to do the deal, but at this point it seemed too much trouble for Mahoney after all the kafuffle and so he said they should just play on the previously agreed upon flattening of the payouts. With that, the cards are back in the air! The players are heading on a 20-minute break. Below are their stacks, with Blatt having just under a 2-1 chip lead. Scott Davies has just hit the rail in 3rd place! He called off his last 550,000 in chips from the big blind after Dean Blatt jammed in the small blind. Davies held and Blatt had . Both players were up on their feet as the dealer spread out a board. With that, Davies was sent packing! It's Blatt and Patrick Mahoney heads-up for the title! Dean Blatt had the button and opened it up to 100,000. Patrick Mahoney called from the big blind and then the two players went to showdown on a board. Both players checked the flop, Mahoney led for 75,000 on the turn, Blatt called and the river was checked. At showdown, Blatt had , which sent Mahoney's into the muck. Scott Davies had 380,000 in front of him when he jammed for 380,000. Dean Blatt called from the big blind and the two players rolled over their hands. The dealer spread out a board, with Davies hitting a king to double up. Dean Blatt has increased his chip lead. This time it started with Blatt opening the button to 100,000. Patrick Mahoney called out of the big blind and then both players checked the flop and turn on a board. On the river, Mahoney led for 80,000 and Blatt raised to 200,000. Mahoney called and Blatt tabled . Blatt is crushing on close to 3 million in chips, while Mahoney is still going strong on just under 2 million.